The engine in today's Nice Price or Crack Pipe Vista Cruiser looks like it's wearing a horned Viking hat. It's easy to see that as it's in the back, under all the glass. You'll need to decide if this custom Cruiser's price is enough to get your horns blowing. Train travel used to be very popular here in the states, and many a rider's favorite car - next to the bar car, of course - was the dome car. These cars featured a split-level design topped with windows that wrapped into the ceiling for a panoramic view. Some of the earliest of these were christened 'Vista Dome' cars and were used mainly on scenic passages such as along the Grand Canyon and past Marilyn Monroe. In the 1960s, Oldsmobile took this cool concept and applied it to their Cutlass wagon - also shared with Buick's Sport Wagon - by raising the roof slightly and adding three tinted windows in that popped-up top. Today's 1972 Vista Cruiser is a fine example of the breed, featuring the extended roof and iconic complex curve windows therein. However, instead of there being bench seats full of rug rats under that glass, there's a built 455-CID monster late of a '70 Olds Toronado. Now as you know, the Toro powerplant was designed for a front-wheel drive arrangement, with the reverse-geared TH425 transmission tucked in next to the mill and driven by a massive roller chain. The huge V8 was claimed in the day to pump out 400 horsepower. Those of course, were pre-reform ponies. Here with a free-breathing Edelbrock manifold, RV cam, and crazy speedboat headers, the amount of power this one's generating is anybody's guess. Those mind-bending pipes perk up and push through the open back window with little more than a pair of resonators to tame the 455's bark. Above those are a mid-roof scoop to feed the engine, and below is a set of wheelie bars. I can't tell you the attraction I have to street cars with wheelie bars. I think it may be a fetish. The other wheels on the car are AR Outlaw IIs, and there's nothing wrong with that. The car is offered with limited description on Craigslist, but there's another ad that offers a little more detail. There the paint is described as having a few minor pits and scratches, and notes that there is no A/C or heat in the car. Of course, the 15 second/92 mph quarter time also mentioned might somewhat make up for that. 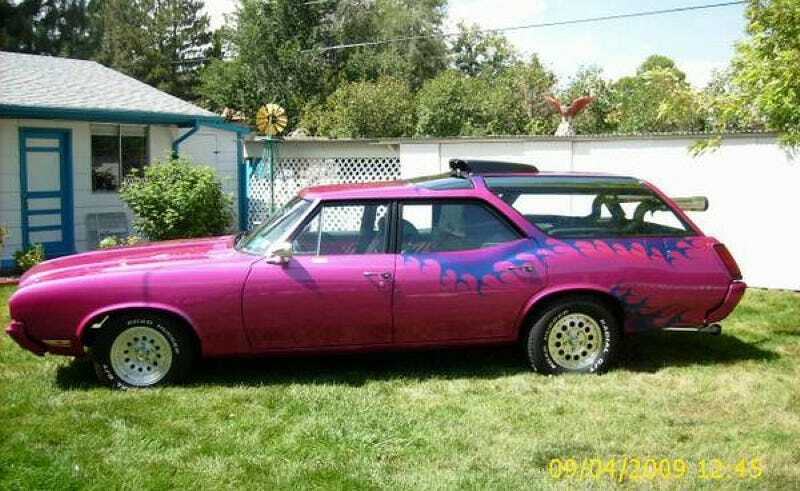 This Olds is very obviously NOT a daily driver, no matter how crazy you might happen to be. What it is however, it's a fun car. The ad says that it's for a 'seasoned driver' only so if you really want to slip behind its wheel you might need to get out the Mrs. Dash. This is the kind of ride that will not only annoy your neighbors with its looks and noise, but will also most likely scare the crap out of them each time you light it up. The car looks to be reasonably sorted out, and the build seems sound. It should be noted however, that the pics are 5 years old. It does say 'Time Machine' on the back of the car so maybe in reality they're brand new. The mind wobbles. Thirteen grand is the asking price for this beast and it's now time for you to decide if that's a good price or not. What do you think, is this wild mid-engine Vista Cruiser worth $13,000? Or, could you just not see paying that much, no matter how many windows it has? Denver Craigslist, or go here if the ad disappears. H/T to NotInDetroit for the hookup!